Viezu has developed an amazing range of gearbox tuning and VAG DSG tuning services. The DSG tuning carried out by Viezu is an excellent complement to Viezu's engine tuning and ECU remapping. Like all our ECU remapping and tuning, each of our DSG tuning files are written specifically for the vehicle and driver, not just off the shelf. The Viezu gearbox tuning and DSG tuning is custom tailored to the driver and vehicle, each DSG tuning file can include launch control tuning, shift and torque limiter tuning and adjustments to give you the ultimate driving experience through your paddle shift gearbox. It is not at all subtle and for your total peace of mind, our DSG tuning of course comes with our 30 day money back offer. You can try, drive and test before you buy. At Viezu DSG tuning is custom - there are light modifications for the DSG tuning that can be made to improve shift speed, responsiveness and smoothness of the gearbox and power delivery. Significant gains in torque delivery can be achieved; track day and sports enthusiast drivers will simply love it. Our DSG remapping offers 70% improvement in DSG shift speed and significant ¼ mile and 0-60 improvement. At Viezu, our DSG remapping is measurable, demonstrable, and very noticeable - you will really enjoy these changes and that's a money back promise. For our more demanding and spirited drivers we can go a little more custom with our gearbox and DSG tuning, very suitable for tuned, high performance and modified vehicles. As well as the custom ECU remapping software and engine tuning, we offer custom DSG tuning and gearbox tuning to ensure your engine performance, modifications and tuning are working in perfect harmony with the level of your gearbox tuning i.e. performance exhausts, sports catalytic convertors (or de-cat pipes), DPF deletions (Motorsport and off-road use only), supercharger and turbo upgrades can all be brought to life further with custom tuning of your DSG performance and torque with our tuned DSG software. With Viezu's fully custom DSG gearbox tuning offering enhanced shift points, quicker gear changes, launch control, and torque settings to suit your vehicle set up, the difference after tuning will be most dramatic, making the use of your DSG paddle shifts so much more fulfilling and giving you true track experience and performance. The DSG shift response can be improved by up to 20% giving you a smoother transition between gears, leading to a decrease in clutch slippage under full load acceleration, releasing more power quicker, and of course reducing clutch wear. With increased DSG shift time you also get an improved paddle-reaction-time - DSG paddle response time is increased by up to 40% in S-mode once tuned. Torque limitation is normally changed as part of the engine tuning but if your gearbox is not tuned too you are missing out, as the DSG also has the torque limited. Lifting on the engine torque is of course only partially effective - isn't it time to test our DSG tuning and feel the difference? Tuning the DSG gearbox's ability to transmit torque is part of the work we will carry out - changes are made from 350 Nm up to 550 Nm, while ensuring the stability and capability of all the mechanical moving hardware within the DSG gearbox. The torque limitations of both your engine and gearbox are now custom tuneable to your specification with Viezu. RPM limitation is normally changed as part of engine tuning, but if your DSG gearbox is not tuned as well you could be missing out! Increasing the shift points of your DSG gearbox will give you command of your engine's power in the higher RPM range; we can raise the DSG transmission's rev limit to work with your engine's new power and tuning settings. 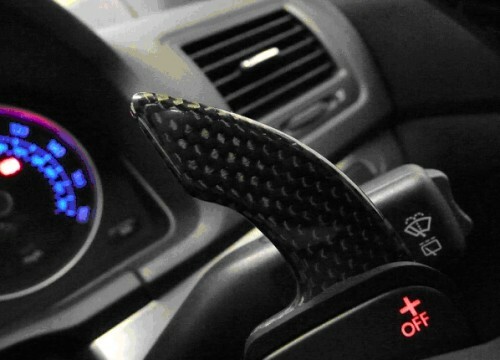 With Viezu's DSG tuning launch control can be activated and tuned on many cars. A perfect launch from stand still can now be achieved, giving maximum 0-60 acceleration times; this is the best way to show-off your car's new performance and tuning and it is great fun too of course! If you are looking to take your tuning to the next level and bring your modifications and engine tuning in harmony with your DSG gearbox, our DSG gearbox tuning is just the answer. And like all our tuning at Viezu, our DSG tuning comes with our no quibble money back guarantee and insurance - time to let the horses loose! Please contact us for further information on how we can help you reach the next level of tuning.